How Much Electricity Does A Wind Turbine Generate? A Wind Turbine Generator (WTG), is basically an electromechanical machine that converts the kinetic energy of the wind into the required rotational mechanical energy by the use of turbine blades, that is needed to produce free electricity. 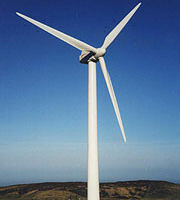 The blowing wind rotates the blades of the turbine which generates electricity upon this rotation. There are two main types of wind turbine: Horizontal axis and vertical axis. They both have their advantages and disadvantages but horizontal axis ones are more common due to higher efficiency. Individual turbine generators can be used for various purposes ranging from supplying energy for some small electrical device where grid connection is not possible or for general home use. They can generate many kilowatts of free electricity and are a popular choice for remote farms, houses and log cabins which have no reasonable access to mains electricity but are in areas with a good amount of wind speed. So what are the main advantages of using a wind turbine generator? They are environmentally friendly as they do not emit any harmful greenhouse gases into the atmosphere or leave any potential harmful residues. They do not consume any non-renewable fossil fuels to produce the electricity, thereby helping the environment. Wind turbine generators are classed as an alternative energy source saving on conventional electrical power generation. Although the initial purchase and installation costs of your wind turbine generator may be high, the savings made in generating your own electricity will offset this cost, so you could be getting your electricity free for many years to come. Turbine generators give you independence by doing away with paying the utility companies for your electricity, and with a turbine generator on your own land, you have your very own power generating plant. Most modern wind turbine generators are available locally or online in a large variety of different sizes and power ratings to suit any homeowners needs. Although turbine generators are based mainly on well established motor-generator designs which have been successfully used for many decades, the newer generator designs are much more energy efficient and as such include many new improvements. In the past, to have a home wind turbine system, most homeowners needed a lot of free space on their property which was completely open and exposed to provide a strong enough and consistent amount of wind to rotate the larger heavier blades of the traditional wind turbine. Back then wind energy was a relatively new, so the old style electrical generators used for many domestic installations were nothing more than scaled-down versions of the larger commercial motor-generators. But these were not very well suited to smaller domestic type installations. To begin with, these early generators required very strong winds to help start the blades rotating, the result was they needed to be fixed and mounted on the ends of tall poles high up above the ground to be able to catch the stronger winds. These generators were themselves very heavy, so they needed to be positioned into the oncoming wind before they would started rotating and generating electricity. This positioning and orientation into the oncoming wind was achieved by using a large tail fin positioned directly behind the generator. As a result of their heavy weight, it required a strong enough amount of wind to rotate it into the required position. Then this meant that most of the time they would miss most of the smaller lighter winds and not position themselves correctly. Although these were very good at turning these stronger winds into huge amounts of electrical power, most residential and domestic locations are not normally favourable to these strong winds. However, a couple of decades ago, smaller modern generator designs began to start to become available on the marketplace that would take fuller advantage of not only the stronger winds but the much lighter winds as well found in most residential locations. These newer wind turbine generators could rotate at much lower speeds than the older generators and because these were lighter and better balanced, they could even orientate themselves into position much quicker without the need of large heavy tail fins. Some newer vertical axis wind turbine designs are even capable of catching and using a light breeze aimed at it from any one direction. These newer more innovative turbine designs make for a perfect turbine generator for use in the home, boat or recreational vehicle, and for the home owner they are actually a lot less expensive to run than the electrical power which they generate. The modern wind turbine generator available today is designed to be installed and used in most residential type installations. So they are manufactured smaller and more lightweight allowing them to be quickly and easily mounted directly onto a roof or onto a short pole or tower. Installing a newer turbine generator as part of your home wind power system will allow you to reduce most of the higher costs of maintaining and installing a taller and more expensive turbine tower as you would have before in the past. Also, although these newer generator designs would generate less power when turning compared to their larger and older cousins of the past, for sure they will be rotating more often and therefore can generate the same amounts of free electricity over a period of time. The result is that these improved wind turbine designs will actually give a more consistent and reliable amount of electrical energy from your wind energy system. As these newer wind turbine generator designs are quieter and less obtrusive, there may be lesser complaints from your neighbours about your wind energy system. Then you can relax in the knowledge that your wind turbine generator will still keep delivering free power from any passing breeze or strong wind for many years to come. Normally there is not enough wind to start generator in most places as a household wind generator need least 3m/s speed wind to push leafs, but now, a new wind generator it can be turned around by 1m/s speed wind, this capability is very perfect, I think. Of cause, as the size is dia 1m, it can’t make power like high power wind generator, but it can provide 400w-3kw power, I think it is enough for most family. Any thoughts. We have a Windspire – unfortunately we also have a solid line of 40-50′ white pines about 150′ due west of unit that cause havoc with production. I thought about cutting a bunch of them down to create a wide opening roughly WSW to WNW. A Windspire dealer suggested I thin them down – say cutting down every 4th or 5th one – he says this will create a tunnel effect, increasing the wind velocity. I don’t mind cutting these white pines down, but the more I cut the more work and the larger the burn pile (this last part isn’t all that bad…). Does anyone know enough about wind dynamics to suggest which alternative is better?